Ice-9 wrote: Nice 3d design, did you make the 3d jack sockets and psu jack socket. any chance of sharing them here for the rest of us. All have details, the resistors with color code, the condensers; IC too; ICs and tranies with sockets and codes!!! all at full details!!! THANKS!! you are my inspiration!!!!!!!!!!! x GodSaveMetal, is it a DIY switch type ? meaning last snapshot on page 1. Is it working ?? Mbas974 wrote: x GodSaveMetal, is it a DIY switch type ? meaning last snapshot on page 1. Is it working ?? The 3pdt switch is the symbol on the DIP module SWITCHES code 7301C; the 2pdt switch is the code 7201C in DIP module SWITCHES too; have fun!!! Mr ICE9 your fantastic layout it´s great; but I note you have a silver mica yellow body, this will help you? In DIP TRACE program go to CAP modules the symbol code CA-10.16/11.5x3.6 is for this 3D model of a yellow silver mica!!! I attach the 3D DIP file!!! Thanks godsavemetal, your 3d components are excellent and the silva mica cap is wonderful. Ice-9 wrote: Thanks godsavemetal, your 3d components are excellent and the silva mica cap is wonderful. Yes Mr ICE9 now you would complete your 3D layout images without no more restrictions?? any 3D you wan´a??? let me know; if I can made I post here!!!! THANKS for your work it´s amazing!!!!!!!!!!! I made a transparent case 1590BB for my layout of the METAL MUFF I have cloned, to see were go what!!! And my invention cuze in PERÚ we don´t have a footswitch; my 3pdt MADE IN PERÚ!! I have to made all my pedals with this switch!! My amazing DEV/NULL II the most HIGH gain DISTORTION/FUZZ pedal! I like your home made 3pdt footswitch, ingenius. Ice-9 wrote: I like your home made 3pdt footswitch, ingenius. Yeah!!! thanks ice-9 I like yours layout too!!! thanks!!!!!!!! in my country nobody knows about the 3pdt footswitch; I have to go with a picture on hand with it, store by store make a tour with the photo of a 3pdt and convence then to bougt the 3pdt or import it and sold it!!! Wll I have to waith another year for the import of the 3pdt by the imported stores in my country!!! If not; well continued to make the 3pdt made in PERÚ in 5th or 6th GENERATION!!! GodSaveMetal, can you share your handmade 3pdt Sir? Ice-9 wrote: I've been messing around with Diptrace again and have made up an example of one of my pedals from schematic to 3D PCBlayout. Some of the footprints I have converted from Guassmarkov Eagle library's, Diptraces 3D library's and the 3PDT switch and caps from a member on this forum ( I think it was Waltk which I will check later and give proper credit to the library maker) Thanks for making them available. OK this pedal is my Bluesman fet based drive pedal and I have put everything on the PCB to see how the 3D view of Diptrace looks also I added a copper pour to the bottom of the PCB as a ground plane. As an idea of how easy it is to learn Diptrace and get from start to finish it took me about 2 to 3 hours to complete this example and this was done on the FREE version, that goes to make an excellent program for free. Yes that is correct Soulsonic the footprint is from the Gaussmarkov library, the 3d mode for the jack was from godsavemetals' 3d parts. 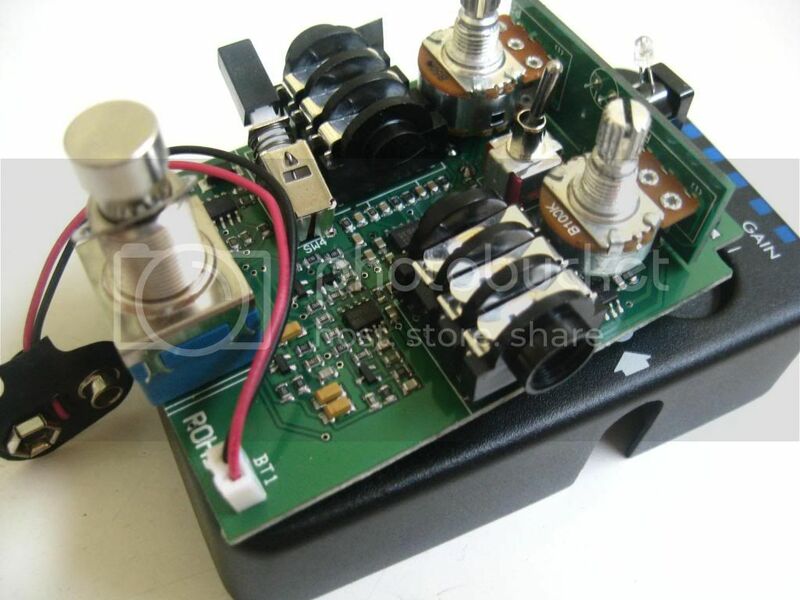 How to make such adapters for potentiometers? It's just a bit of pcb mounted vertically, it will have a few pads at the bottom to mount a 90 degree pin connector, you could use a bit of vero board to do the same thing.